NarrowBand-Internet of Things (NB-IoT) is a Low Power Wide Area Network (LPWAN) radio technology standard developed to enable a wide range of devices and services to be connected using cellular telecommunications bands. The NB IoT technology provides improved both indoor and outdoor coverage, supports massive numbers of low throughput devices, low delay sensitivity, ultra-low device cost, low device power consumption and optimized network architecture. Being massivelly deployed from 2018 and until now, the NB IoT world coverage become significant. You may check the coverage here. Despite in this map, Romania LPWAN coverage is represented only by LTE-M, we can confirm that at September 19'th 2018, Vodafone Romania announced the deployment of their NB IoT network at national level. 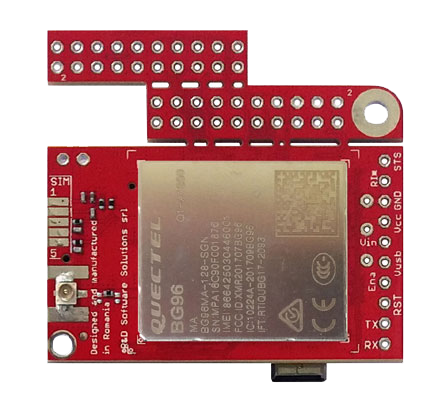 BG96, the Quectel flagship modem, it's based on Qualcomp chipset and supports both LTE-M and NB IoT technologies, accomplished by 2G fall-back and GNSS capabilities. 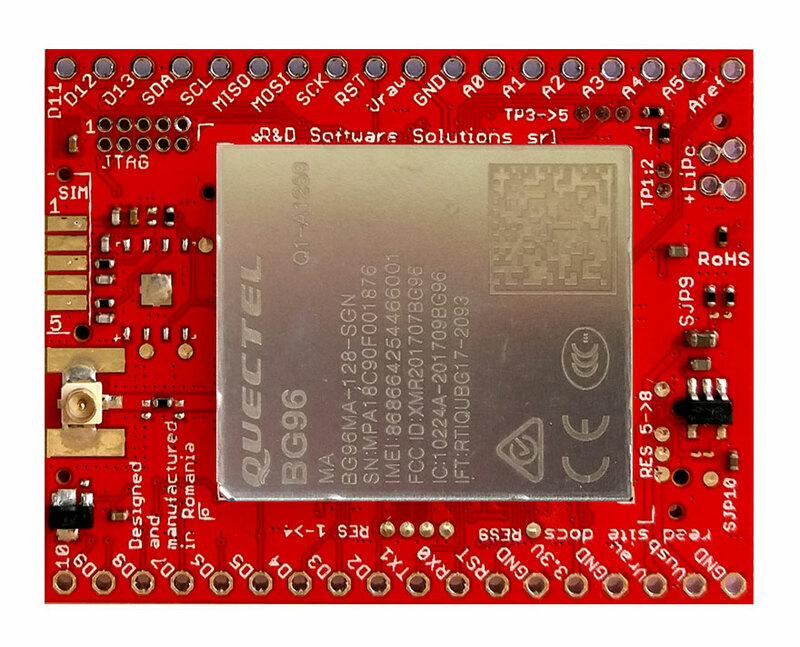 In our opinion, BG96 it's still on top of NB IoT modems implementations worldwide. itbrainpower.net have commercially available two shields equipped with BG96: u-GSM by itbrainpower.net and xyz-mIoT by itbrainpower.net. 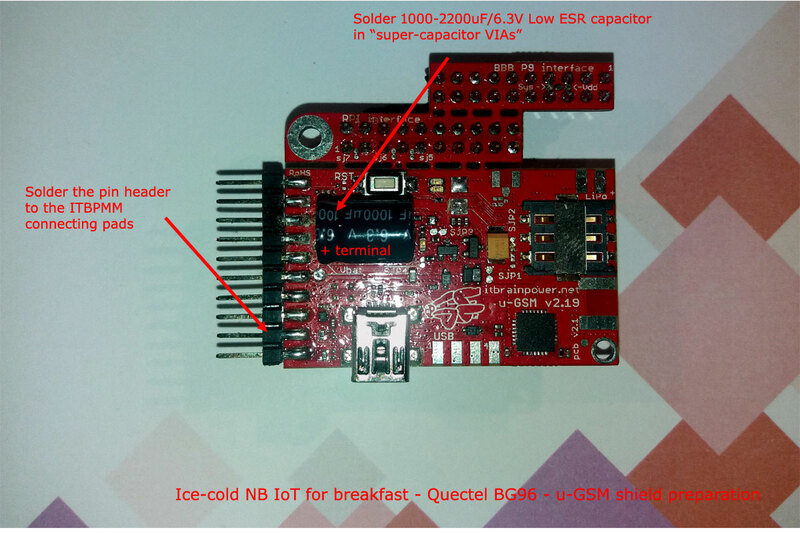 itbrainpower.net u-GSM shield it is the worldwide first [commercially available from 2018-07-18] and most compact modular modem that supports ALL deployed GSM standards [LTE NB IoT / LTE CATM1 / LTE CAT4 / LTE CAT1 / UMTS-3G / GSM-2G] in one unified design! This amazing u-GSM shield may replace all different modem designs by giving to you the same form factor, same interfaces and same integration approach. Just pick the PN that fits your request and that's all. 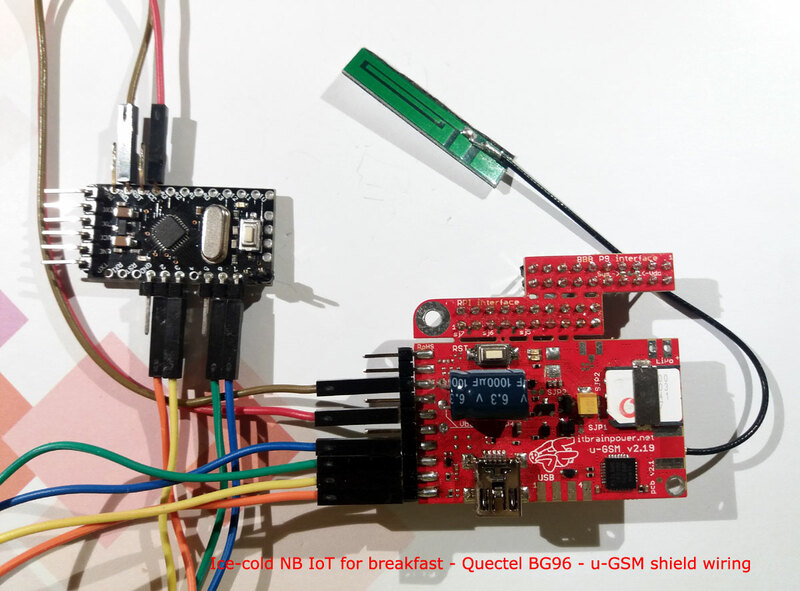 Following NB IoT tests and guidelines are exemplified using u-GSM shield equipped with Quectel BG96, PN: UGSM219-BG96#UFL. 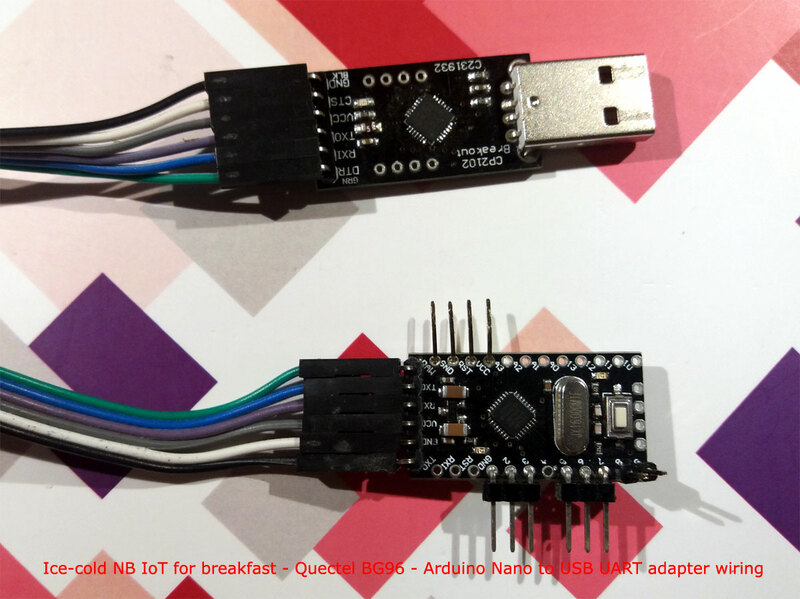 The very same NB IoT tests may be easy replicated using the xyz-mIoT shield equipped with Quectel BG96, PN: XYZMIOT209#BG96-UFL-xxxxxxx. 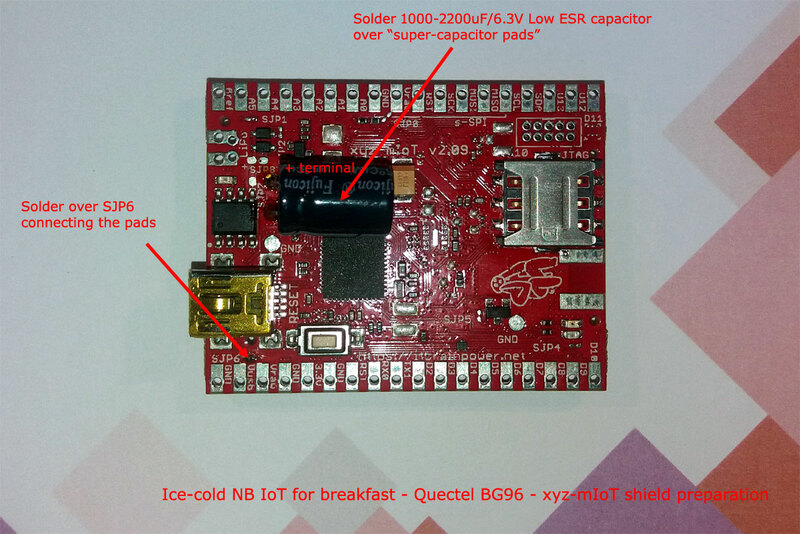 At April 08th 2018, R&D Software Solutions srl [itbrainpower.net] revealed to the public the announcement of the xyz-mIoT by itbrainpower.net shield - the first, and the most compact, IoT board that combines the versatility of ARM0 micro-controller (Microchip/Atmel ATSAMD21G in Arduino Zero compatible design), the comfortable use of the embedded sensors bundle with connectivity provided by LTE CAT M1 or NB-IoT long-range & low-power modems or legacy 3G / GSM modems. The xyz-mIoT shield may have up to 5 integrated sensors, as: THS (temperature and humidity sensors) - HDC2010, tVOC & eCO2 (air quality sensor - CO2 total volatile organic compounds- CO2 equivalent) - CCS811 , HALL (magnetic sensor) - DRV5032 sau or IR (infrared sensor) KP-2012P3C , secondary IR (infrared sensor) - KP-2012P3C , TILT (movement vibration sensor) or REED (magnetic sensor) - SW200D. Embedded sensors that populates the xyz-mIoT shield are dependent on PN ordered (check here for available PN). 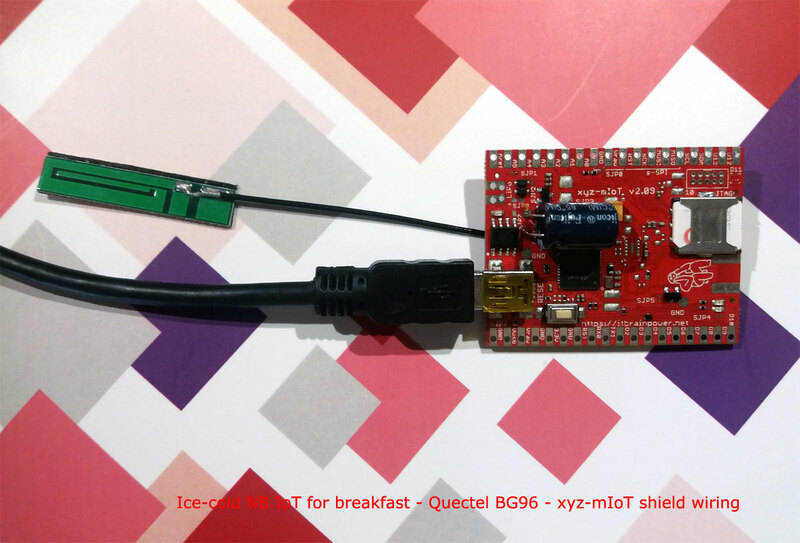 Good to know about the xyz-mIoT shield equipped with Quectel BG96, PN: XYZMIOT209#BG96-UFL-xxxxxxx - it's still the worldwide only shield that gather together ARM0, sensors, embedded SIM support, LiPO battery charger, GNSS location services, LTE-M, NB IoT and 2G services in such small form-factor and being supported by Arduino programming. * Episode 1 (this one) - hardware setup required in order to run the software. * Episode 2 - Install Arduino classes required and test the NB IoT network states BG96 detection (ACTIVE, IDLE and PSM) and raw UDP data transsmision. * Episode 3 - BG96 force disable PSM mode (BG96 used in permanent ACTIVE/IDLE mode - soon available. * Episode 4 - how to upload sensors data using NB IoT UDP transmission to AllThingsTalk Cloud - soon available. UGSM219-BG96#UFL [NB IoT second generation modular modem] + Arduino Nano shield (or other Arduino shield) + USB-UART adapter + some 2.54mm pin-headers and connecting wires. Episode 1 estimated time: 10-15 minutes. The implementation time may vary depending on previous user experience. .
a. solder the pin header [7 x 2.54mm] to ITBPMM interface pads as in picture up-here. b. solder the 1000-2200 uF /6.3V Low ESR capacitor to the "super-capacitor VIAS". Keep in mind the capacitor polarity [connect + pole to the Vpad+ VIA and - pole to GND VIA]! b'. solder LiPO battery connector to the LiPO GND and + pads. Capacitor / LiPO battery connector pads details in image bellow. Insert the micro-SIM in his slot [the SIM must have the PIN check procedure removed]. Connect the antenna. 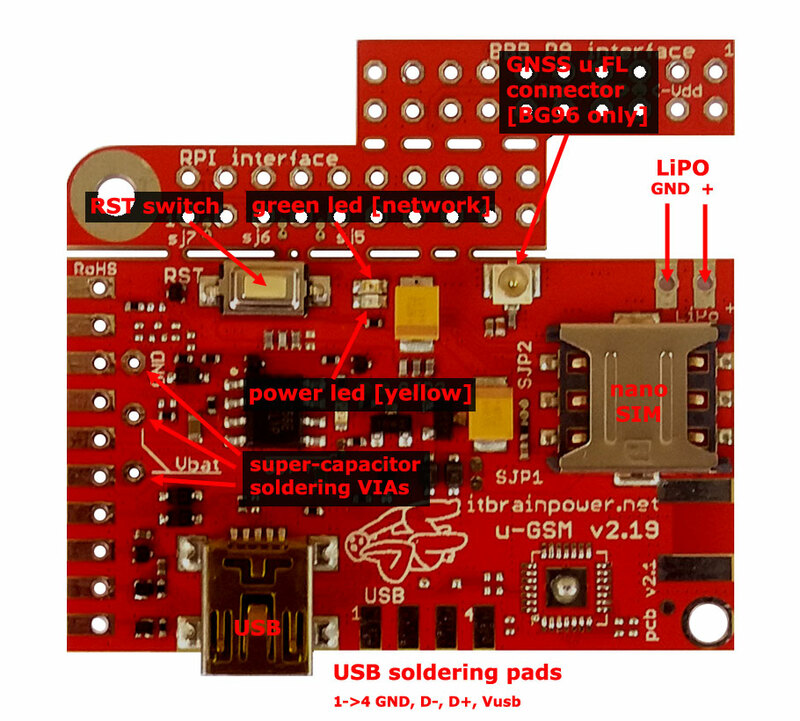 Above wiring guide solve Arduino Nano + u-GSM shield powering directly from the USB. Same wiring can be applied if you use LiPO battery instead 1000uF capacitor. a. Enable 5V from USB to be primary power supply for the xyz-mIoT shield as described up here [solder over SJP6 pads - connect both pads]. Alternative: solder both connectors rows, place the board into one breadboard and connect between Vusb and Vraw using one male-male breadboard wire. b. solder the 1000-2200 uF /6.3V Low ESR capacitor to the "super-capacitor PADS". Keep in mind the capacitor polarity [connect + pole to the Vpad+ pad and - pole to GND pad]! Insert the micro-SIM in his slot [the SIM must have the PIN check procedure removed]. Connect the antenna, then connect the USB cable to xyz-mIoT USB port and to your computer. The xyz-mIoT shield will be powered from the USB. Well done, boys! Looks like we're have ice-cold sushi for breakfast!... Now the hardware it's ready for the NB IoT tests! TUTORIAL PROVIDED WITHOUT ANY WARRANTY!!! USE IT AT YOUR OWN RISK!!!! Dragos Iosub & itbrainpower.net team original how to.